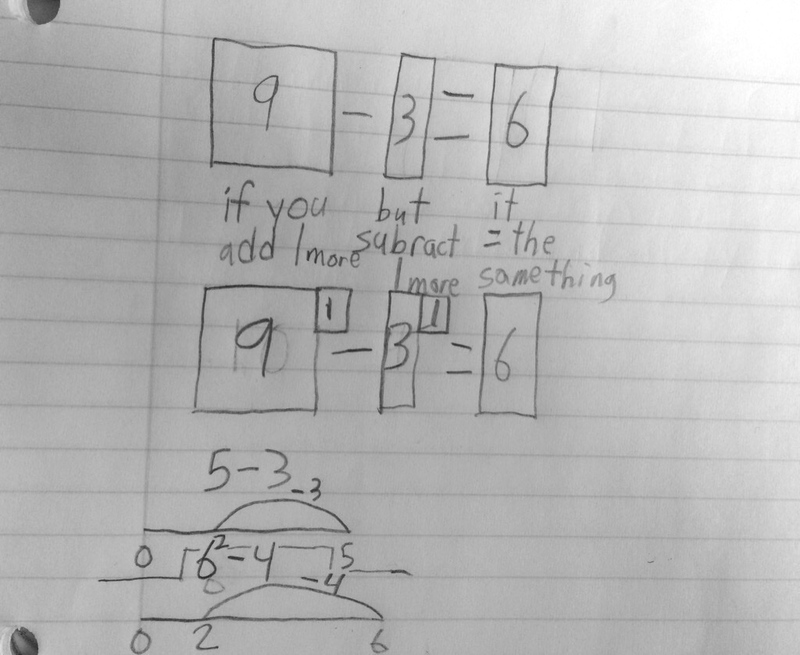 After a Number Talk a couple of days ago, I blogged about my students’ thoughts around a subtraction problem. Instead of being a talk about subtraction strategies, as I anticipated, it ended up more of a talk about the meanings of subtraction. 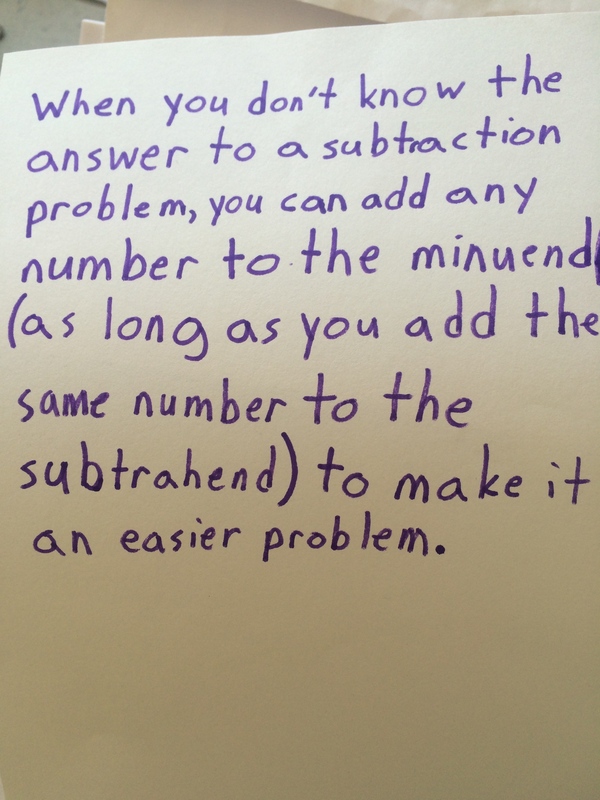 Now being in 5th grade, I began asking myself a bunch of questions…If these subtraction meanings arise in 3rd grade, do we ever have students explicitly investigate them? Once they have an efficient strategy to subtract, do we just move on? 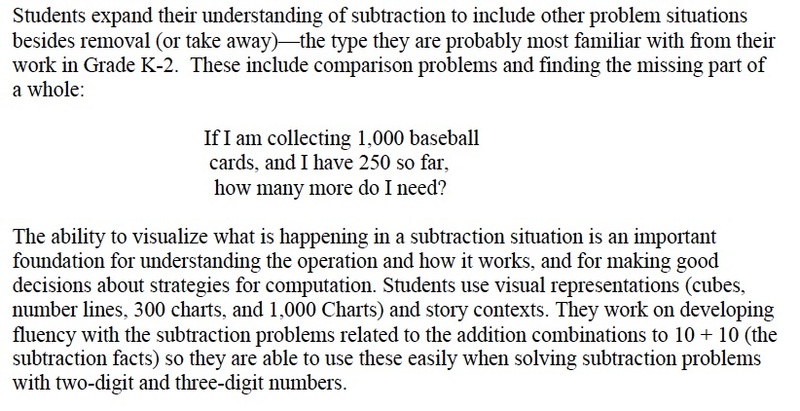 Do we think that the meanings of subtraction really do not matter if they can read a context and solve for the solution? After reflecting on my own practice, I honestly think it is a combination of all of these things. I am completely guilty of being satisfied if students are able to understand how to solve a problem, with or without a context, and explain their reasoning. 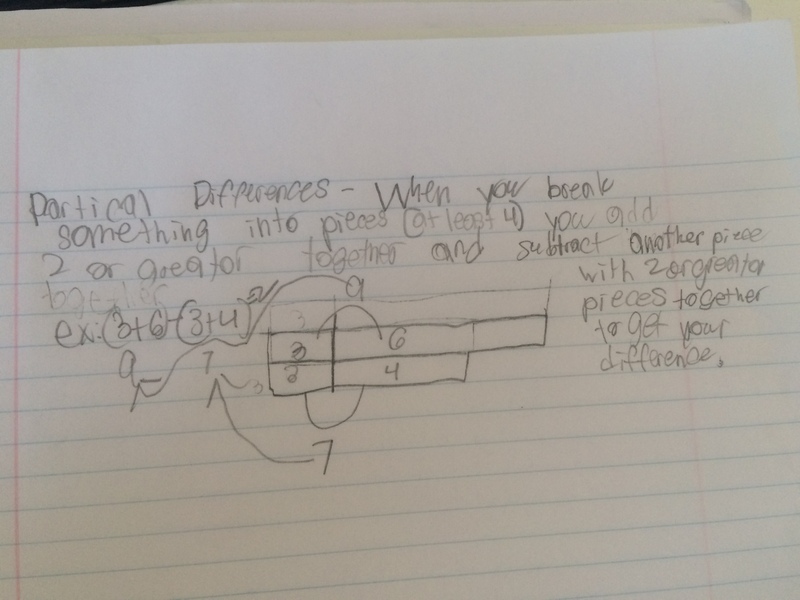 I actually feel quite great about student understandings in that moment, however, I have really seen the importance of having students make deeper connections, create conjectures and justify claims/generalizations. It truly pushes them to think about a deeper meaning of operations and demonstrates the depth of their understanding in developing proof of their thinking. 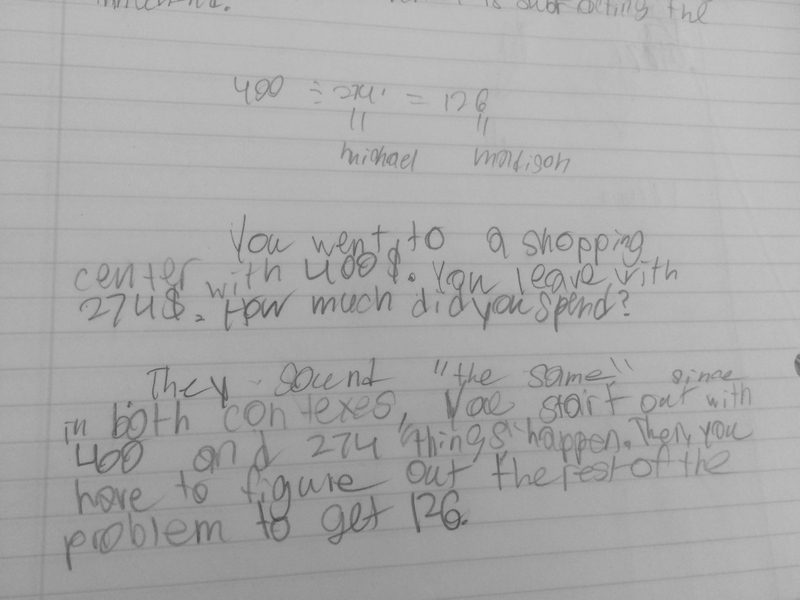 The day after the Number Talk, I had the class split into two groups and each focused on writing a context that would lend itself to being solved using one of the two strategies for 400-274. After about 5 minutes, I had each group share their context and they did just what I was hoping. The group with the top strategy had a few contexts that all involved having something and then giving something away or losing something. The bottom strategy had a context involving having $400 and leaving the store with $126 and asked to find how much they spent. The second was much more difficult because they kept arguing (in a great way) that it was an adding up problem, not subtraction. I had each group read their context aloud twice. The first time I could tell everyone was listening to see if it could be solved using subtraction so for the second time, I gave them a listening focus. I asked them to listen for how the two contexts were different, was something different happening in each? 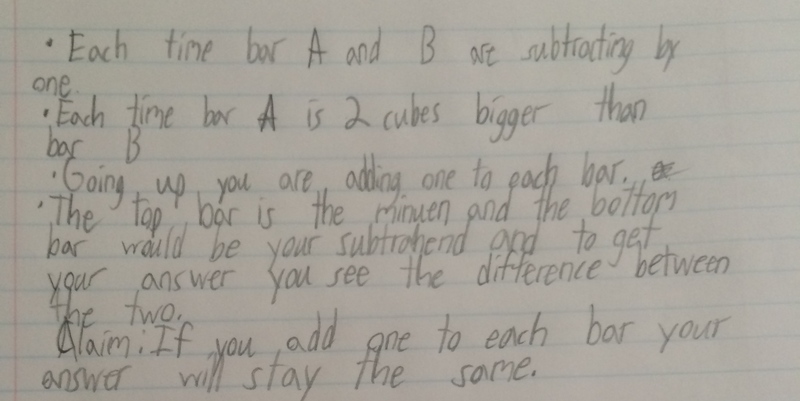 After reading them aloud once more, I had them journal what they thought, were they the same type of subtraction problem or different? (They referred to the problems by the student’s name whose strategy it matched). There was an overwhelming “what is left” and “what the middle piece is” theme among all of the responses as the main difference between the two contexts. 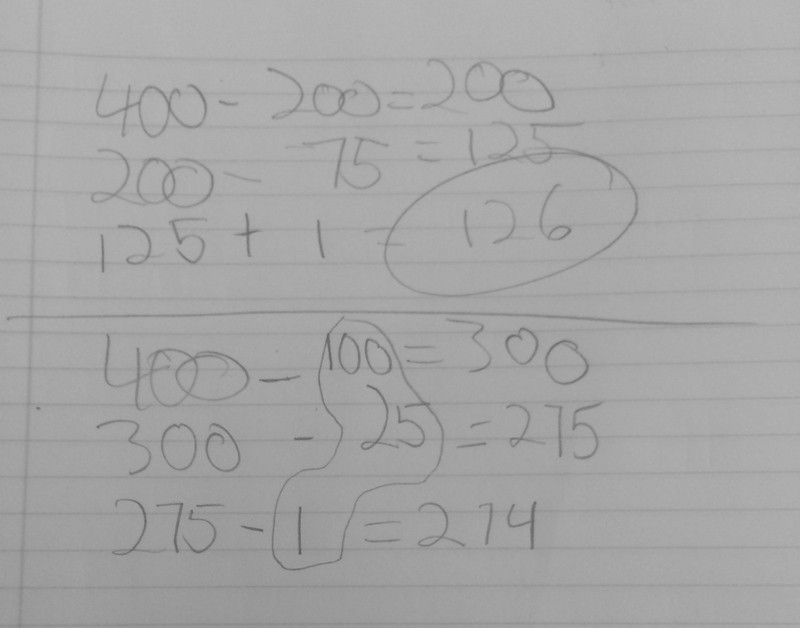 Knowing that removal is their primary way in which to think about subtraction, we chatted more about this missing piece and they agreed that they think about that context more as adding up, which makes complete sense to me. It was so nice to hear them talking about the way a context can influence how you use subtraction or addition and how it really was doing the same thing. 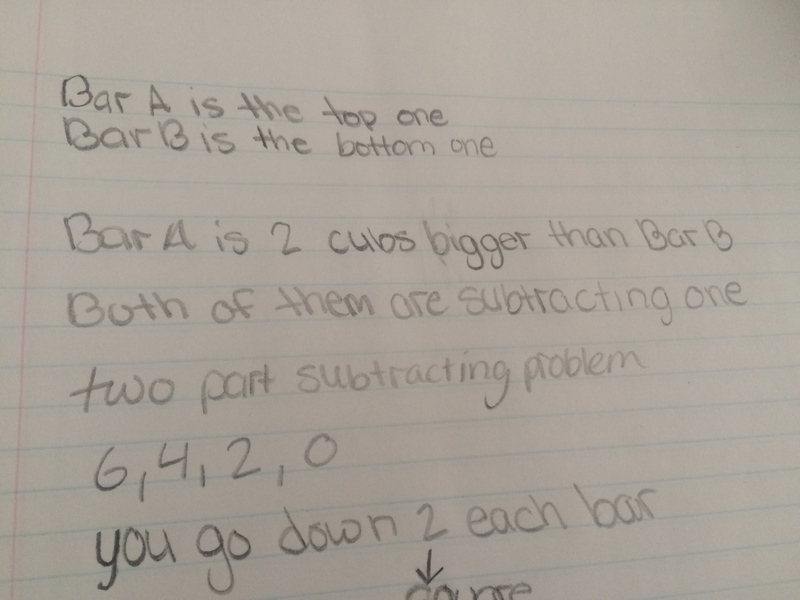 At the beginning of class today, I asked the student who wrote the response above, what he thought about this visual and he said, “Well, that is just like what I was saying.” I asked him if he could work on a claim for the way he is thinking about subtraction while I asked the rest of the class to see if they could think of a claim that this representation would support. This was such an interesting reversal of the usual process I use with student claims, but I was excited to try it out! 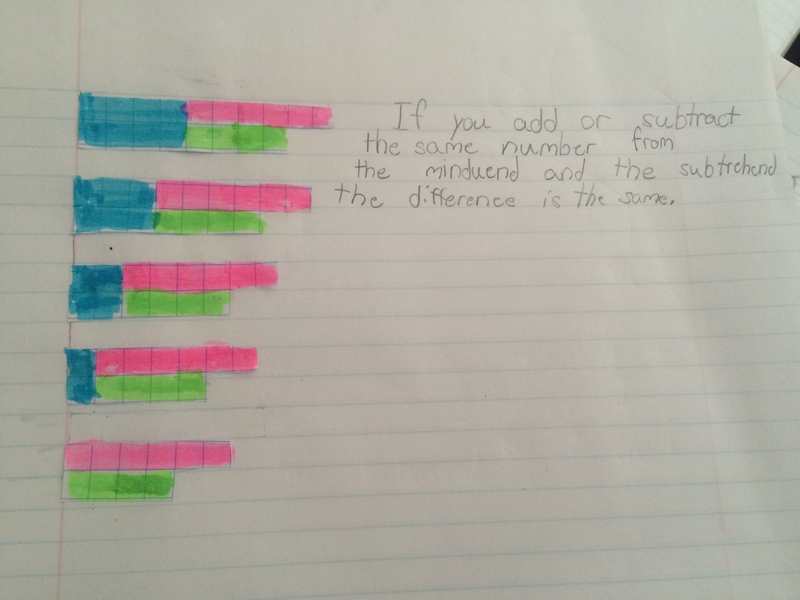 …and asked them to think of these more as subtraction problems and see what they could come up with in terms of noticings and/or generalizations. I got some awesome responses! 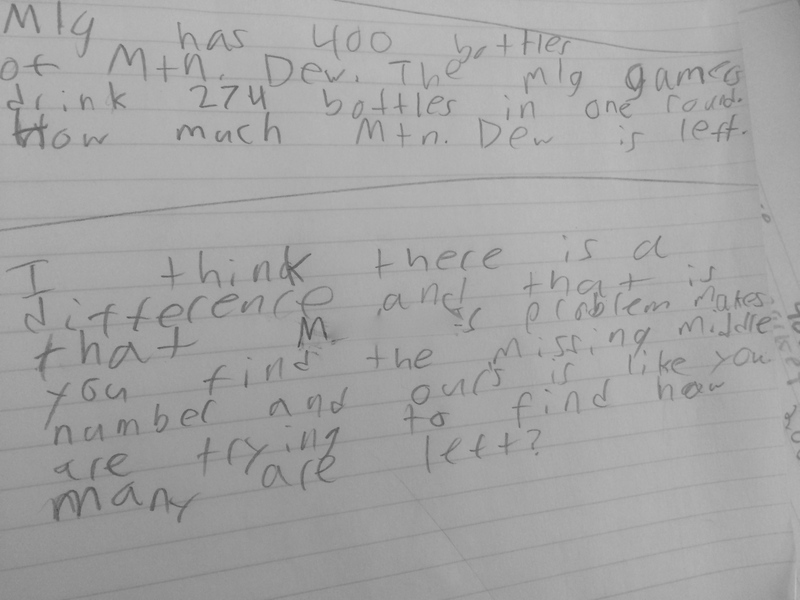 I love that he was not only thinking about what was happening in the problem, but also why he would want to use this in order to make a problem easier to solve. These lessons were a beautiful way to work forward and backward in making claims. Thank you Simon for being so amazing, as always, it was not only great learning, but great fun! My next task is thinking of questions to ask him about this…. What a great lesson! I really have to spend more time with colleagues in the math twitter world! And great to see algebraic thinking developing and becoming economically expressed. Like “Bar A is two cubes bigger than Bar B”.